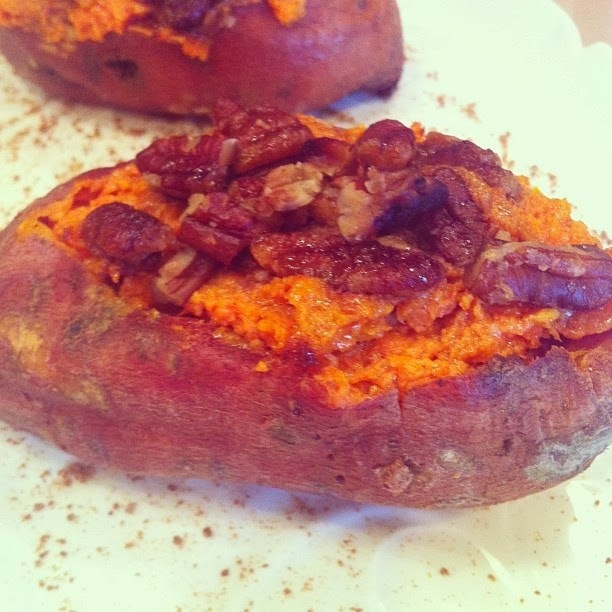 Here's a simple, delicious side dish idea- perfect for Thanksgiving, or any time of year! This recipe combines warm fall flavors in a delicious way you can feel good about~ packed with fiber & vitamin A. 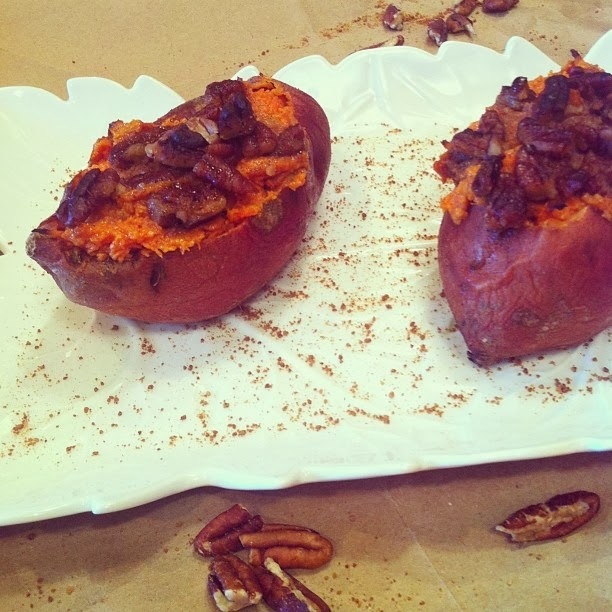 Now sweet potatoes taste amazing all on their own, but when combined with cinnamon & pecans... they are so much better. 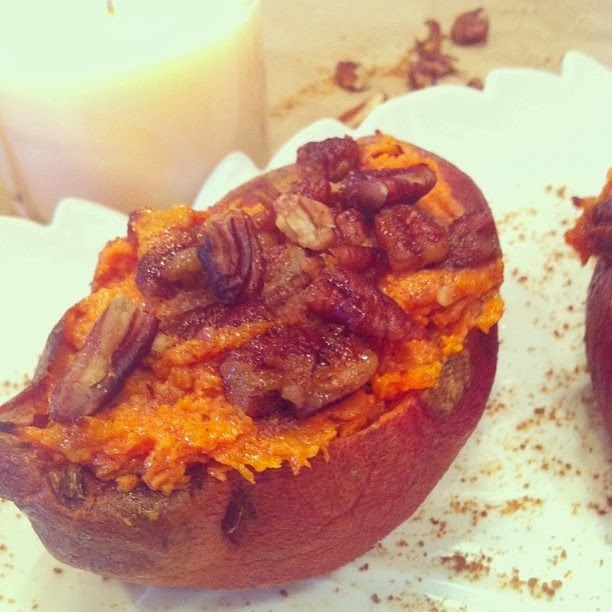 It's so easy to do these "Paleo-style"~ without losing out on any flavor whatsoever. I actually love how these aren't overly sweet. The sprinkle of coconut sugar on top is just enough to compliment the natural sweetness the potatoes have on their own. 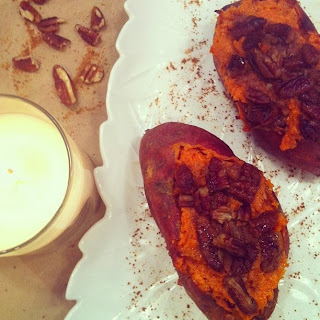 I came up with this recipe for my boyfriend's birthday dinner, since he's a Paleo eater & sweet potatoes are his favorite. I swear he eats one everyday! Both my boyfriend & my parents fully approved of these. Even my dad, who isn't always a huge sweet potato fan, was scraping the skin to get every last bite. I really love how easy these are to serve alongside any meal. They're also simple to make & sure to please even the pickiest of eaters. You could easily prepare them ahead of time & do the final bake when you're ready to eat them; perfect for a busy Thanksgiving day. Let me know if you give these a try, & enjoy! Pierce holes in the sweet potatoes with a fork, & bake on a foil lined baking sheet for about 45 minutes, or until soft. Let cool until room temperature. Slice the tops off of the potatoes and scoop the flesh out into a large bowl, being careful not to tear the skins. Add the melted butter, cinnamon, nutmeg, & sea salt and smash with a fork until they are a desired consistency (I like mine more chunky than mashed). Use a small spoon to fill up the empty sweet potato skins. Combine the topping ingredients in a small bowl & distribute across the tops of each potato. Return the sweet potatoes to the baking sheet & bake for an additional 15 minutes, or until warm throughout & slightly browned on top. OMG. This, with coconut milk (the super thick kind) would be insane!